A goði or gothi (plural goðar) is the Old Norse term for a priest and chieftain. Gyðja signifies a priestess. During the Viking Age, the goði was originally a heathen priest. 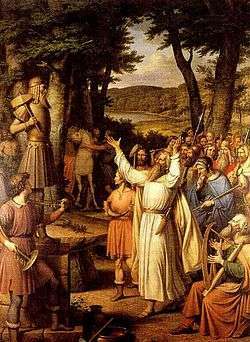 After the Settlement in Iceland, the hofgoði was a temple priest; this was usually a wealthy and respected man in his district, for he had to maintain the communal hall or hof in which community religious observances and feasts were held. The area over which a goði had leadership was termed a goðorð. Over time, and especially after 1000, when the Christian conversion occurred in Iceland, the term goði lost its sacred connotations and came to mean simply "chieftain". The name appears in Wulfila's Gothic language translation of the Bible as gudja for "priest", but in Old Norse it is only the feminine form gyðja that perfectly corresponds to the Gothic form. The corresponding masculine Old Norse form would have been an unattested **gyði. 1 2 3 An Icelandic-English dictionary by Richard Cleasby and Gudbrand Vigfusson (1874) p. 208. Hellquist, Elof. (1966). Svensk etymologisk ordbok. C.W.K. Gleerups förlag, Lund.